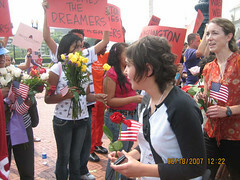 [Washington, DC] On June 18th, 100 “Dreamers” from Boston, Chicago, Columbus, Knoxville, Los Angeles, Miami, New York, Nashville, Philadelphia, Richmond, San Antonio, Seattle, Toledo, and Tucson were welcomed to our nation’s capitol by a delegation of DC-based pro-immigrant rights supporters at Union Station. This welcoming event, organized by Casa de Maryland, SEIU 32 BJ, and the National Capitol Immigration Coalition, was followed by a press conference featuring Dreamers, elected officials and immigration movement leaders. D.C. Ward One Councilmember Jim Graham presented a resolution in support of the tour. Major media attention has greeted the Dreamers on every leg of this tour, putting human faces and stories to the issue of just and humane immigration reform. “The Dreams Across Ameica Tour has held a mirror to the American people and reflected back an American story that we all experience about sacrifices, family, tradition, and dreams. This Tour is made timelier by the stalled immigration reform debate in Congress. The Dreamers’ stories speak directly to the need for just & humane immigration reform,” stated EunSook Lee, Executive Director, NAKASEC. As one of the six anchoring organizations, the National Korean American Service & Education Consortium and our affiliates – Korean Resource Center in Los Angeles, Korean American Resource & Cultural Center in Chicago, and YKASEC – Empowering the Korean American Community in Flushing – recruited five Korean Americans to be “Dreamers”. “In the same way that the Korean War separated my family, today's immigration policy is separating immigrant families and it is a new war against humanity. I got on this train with the dream of creating a society where families, not politics, are considered the priority, workers are paid appropriately, children are free to reach their full potential, and people are treated with respect & granted equal rights regardless of their immigration status,” said Hee Pok Kim, a Korean American Dreamer from Los Angeles. “When I came to the US 40 years ago, I felt welcomed. Many people warmly invited me to their place and treated me well. I do not feel that America is the same welcoming place anymore. I boarded the train to keep alive the hope for families in my church to be reunited but also for a more just society that welcomes every immigrant who works hard to make substantial contributions to this country,” said Rev. Mie Hae Rhee, A Korean American Dreamer from Chicago. Bios are attached. Interviews available upon request. Contact Jeong Yeon Hong at 323-937-3703, extension 204. The Dreams Across America Tour is a national public awareness campaign to put human faces and stories to the issue of comprehensive immigration reform. One hundred diverse individuals have rode the rails, telling their compelling stories to reinforce what still holds true today – no matter our backgrounds, immigrant or native born, we all cherish the values that make this country prosper. However, only by working together to address our nation’s broken immigration laws, can we continue to achieve and live the American dream. Watch more stories and sign our petition at www.dreamsacrossamericaonline.org. The mission of the National Korean American Service & Education Consortium (NAKASEC) is to project a national progressive voice on major civil rights and immigrant rights issues and promote the full participation of Korean Americans in American society. NAKASEC was founded as a consortium in 1994 by local community centers that realized that only be coming together can we build and contribute to a national movement for civil rights. They are the Korean Resource Center in Los Angeles, the Korean American Resource & Cultural Center in Chicago and YKASEC – Empowering the Korean American Community in New York. On August, 11, 2005, at 15 years of age, I began a new life alone after my parents were forced to leave the United States. My name is Andrew Gyu-Hang Jung, a junior high school student at Emmanuel Baptist and the only child of Dae Hwan and Young Mi Jung. My parents came to Toledo, Ohio as a newlywed couple in 1984 from South Korea. My father was able to obtain an I-20 that allowed him to attend and graduate from the University of Toledo with a degree in Mechanical Engineering. Born and raised in Toledo, I was blessed with great parents who supported and loved me dearly. I became a top student at Emmanuel Baptist School and developed great passion for violin. My family was actively involved in our community, especially at Emmanuel Baptist Church. My mother’s dedication to volunteer her time and energy at my school was recognized with a community service award. My father worked diligently and paid taxes, first as a dishwasher and later as a sushi chef at a local restaurant. However, as a result of misfiling by my father’s student advisor’s office at the University of Toledo and disreputable lawyers, my parents became undocumented. On Valentine’s Day, 2005, Homeland Security officers came to our door and took my mother away, leaving my father to care for me as a minor. As it is evident my story, the current outdated immigration policy in America affects not only non-citizens but also US citizens such as myself. As the topic of immigration reform is gaining momentum and significant amount of attention around the nation, I have two critical questions for the government. First, why would you arrest and incarcerate my mother, a non-criminal, for 178 days during which she was moved to 10 different detention centers within the State of Michigan and suffered major health problems but never require a simple court hearing to decide if such punishment was appropriate? Second, while I understand that national security is an important concern in relation to immigration policy, how does deporting a school volunteer and sushi chef improve our security? My family came to the States with great hope for a better life in which our dreams can be fulfilled. I have dreams of being a competent doctor or a business owner in Toledo, a loving father, and a contributing member of this society as my parents had been. It is my earnest hope that these dreams can be realized in the presence of my parents. I ardently plead for a fair immigration reform that will not only lift the 10-year ban imposed on my parents and allow my family to be reunited but will also respond to the various but equally heartbreaking and unjust suffering and tragedies that countless immigrants in this country encounter everyday. My name is Hee Pok Kim, more widely known as "Grandma Kim" of Koreatown originally for my 6 years of activism in the Bus Riders Union and later, the Korean Resource Center. I was born and raised in Korea during the time of Japanese occupation, and I supported my parents who were fighters in the Independence movement. These times of great struggle and pain led me to develop a strong passion for civil activism which continues to be a driving force of my life. My children came to the United States in the early 1980s as students hoping for better lives. They managed to find jobs and successfully settle in this country. As an immigrant who was lucky enough to be allowed to reunite with my family in the States in 1988, I have great sympathy for those who cannot join their families due to the gross flaws in the immigration system. The reason I came to the United States was in fact due to a painful history of being separated from my family members. My parents and siblings were born in North Korea and before the Korean War, when Korea was not divided I got married and moved to Seoul. After the War broke out, I have not been able to see my family again. It was also during the War that I was separated from my husband and became a single mother raising two children on my own. After having gone through such tragic and heartbreaking separation, I just wanted to be with my two sons in the United States. Since the War, it is not possible to enter North Korea from South Korea, but through a third country. When I finally visited North Korea in 1991, I learned that all my immediate family members had died. My mother had cried so much after losing me that she was blind by the time she passed away. In the US, I saw my dearest friend bidding painful goodbye to this country due to her undocumented status, fear of raids and deportations, and growing sentiment of hatred toward immigrants. I've met many talented young immigrants struggling to acquire higher education. All children are precious members of this society and it is our responsibility to help them achieve their dreams. This is why I dedicate my time and energy to march, to gather signatures and to testify at town halls. In the past 4 years I have spoken out for the need to protect vital public health and safety program. In 2004, I collected more than 500 signatures in support of the DREAM Act and I am now a founding member of Community Health Promoter (CHP) at the Korean Resource Center. CHP is an organized group of seniors supporting language access and quality healthcare for all. I have even gone to Washington, DC to speak with legislators about the hopes and dreams of millions. In the same way that the Korean War separated my family, today's immigration policy is separating immigrant families and it is a new war against humanity. I will get on this train with the dream of creating a society where families, not politics, are considered the priority, workers are paid appropriately, children are free to reach their full potential, and people are treated with respect & granted equal rights regardless of their immigration status. 40 years ago, Korea was faced with extreme poverty and famine, suffering from the deadly consequences of the Korean War. I came to the US after hearing that America was a beautiful country in which my dreams and hope for a better education and life can be realized. I got my degrees in social work, political science and theology. I also married my husband who was a student at the time. While in the United States, I was involved in a deadly car accident 20 years ago where two people died which completely transformed my values and beliefs. It led me to abdicate the desire for material success and to start a ministry at my own expense. God responded and gave me a chance to start the Mongolian American church in Chicago. At my church, I interact with about 25,000 Mongolians who recently immigrated to the United States. Although they work diligently and duly pay their taxes, they suffer from discrimination, poverty, and the broken heart of leaving their children behind. Mothers often call me and cry because they cannot bear to pass another day without seeing their children. I developed a strong sense of obligation and mission to respond to their cries and suffering. When I came to the US 40 years ago, I felt welcomed. Many people warmly invited me to their place and treated me well. I do not feel that America is the same welcoming place anymore. I will board the train from Chicago to keep alive the hope for families in my church to be reunited but also for a more just society that welcomes every immigrant who works hard to make substantial contributions to this country. I want to strengthen and help my community. My name is Kevin Kang, a junior at Johns Hopkins University. My parents met in the United States as students struggling to make a living and got married. They managed to save enough money to open up a store that they have now been running for more than 15 years. It was through their sacrifices and hard work that I went to college, studying the subjects that fascinate me and enrich my life everyday. My active involvement in Young Korean American Service and Education Center in New York led me to see that the dreams of countless talented youths in this country are never realized due to their immigration status. I cannot imagine what I would be doing if I was unable to attend college. I cannot fully comprehend the kind of desperation and hopelessness that one wakes up feeling everyday, knowing that she is not at a place where she wants to be. Upon realizing this lamentable reality, I became an ardent advocate of the Dream Act. I strongly believe that the hard work and sacrifices of countless immigrants and their children are an invaluable component of our society. It is not right that young undocumented students in America who have spent the majority of their lives in the United States and have great potential are barred from pursuing their dreams. The United States does not gain anything by preventing them from achieving their goals and becoming contributing members of this society. I am getting on this train simply as a student who wants other fellow students to enjoy the same privileges and rights that he has been lucky enough to enjoy. I join this exciting journey with a wholehearted dream of creating a society where everyone is given a chance to reach her full potential. On the night of June 2, 2000, my entire family's hope and dream for a stable life and permanence residence in the United States disappeared in a split second. My father, Tae Youk, was murdered on the floor of a convenience store on Ranchester, and my family was no longer eligible for the green cards that we were months away from receiving through sponsorship from my father. Although my case is pending, I still live in fear. My name is Hang Y. Youk, a student at University of Houston, Texas majoring in accounting. My father came to the United States to earn his doctorate degree in theology at the Houston Graduate School of Theology. He decided to settle in this country when a church offered him a job and a green card for him and the rest of the family including myself. We came to the US in 1998. Since then, I have worked diligently to maintain a 3.9 GPA at school and taken a leadership role as a cell leader and an educational coordinator at the Korean Christian Church of Houston. My family was happy, content, and waiting to be given the much desired legal status to reside in this country until that night. Without even having sufficient time to mourn for the loss of my loving father, we were immediately faced with the grave uncertainty and fear of unstable status in America and hence with obstacles of finding employment and making a living. Despite the heartbreaking and painful struggles, I still believe in the American Dream which can only be realized through relentless efforts and courage to adhere to the principle of equal opportunity and meritocracy. My story is not at all an exceptional or unique one. It represents the harsh reality that countless immigrants face in this country. From Houston I get on this train carrying the undying hope of that my mother and sister can continue to live in this country they call home without any fear of deportation or discrimination. And, I join this cause with the dream of shedding new light on the negative yet flawed images of immigrants, thereby leading many to realize that we are constructive members of this society and will continue to make positive contributions.